Tough, durable polyethylene moulding with slip resistant treads and rounded corners. Lightweight and suitable for indoor or outdoor use. Choice of 2 or 3 tread versons. L x W x H: 600 x 510 x 370mm. If you need to reach higher areas at work or around your home, you would benefit from a set of steps that are easy to carry from one place to another but that can support the user. Our lightweight plastic static steps are easy to carry around with a rope handle and are suitable for indoor or outdoor use making them ideal for at home or work. 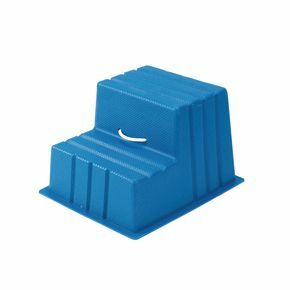 They are tough, durable polyethylene moulded steps with slip resistant treads and rounded corners for safety. The dimensions of the steps are; L x W x H: 600 x 510 x 370mm and they are tested to EN14183 2003E. They are available with 2 or 3 treads and there are three colours to choose from; blue, green or red. Our lightweight plastic static steps are a benefit at home or work helping the user to access hard to reach areas and they come with FREE UK Delivery.